Wonderful drawings from winners Gary Lawrence, Jessie Brennan and student Kristian Fletcher. Plus lots lots more. Detail from Imagery Imaginary Volume 1 by Lottie Jackson-Eeles. The Jerwood Drawing Prize returns for 2011 at the Jerwood Space, with another fantastic range of art based around the concept of drawing today. Watch out for work by winners Gary Lawrence, Jessie Brennan and student Kristian Fletcher. 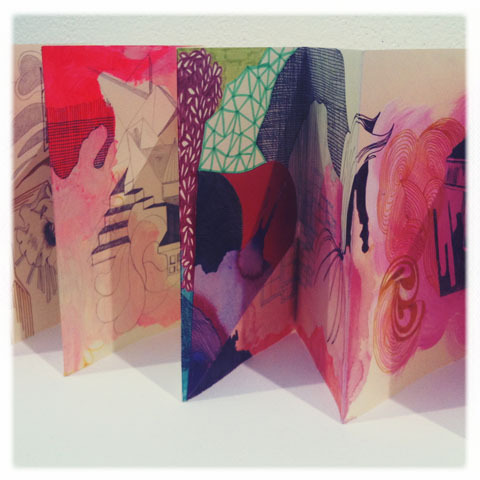 Plus wonderful pieces from surrealist artist Iain Andrews and a super colourful sketchbook from Lottie Jackson-Eeles. The exhibition continues to BayArt in Cardiff and Burton Museum & Art Gallery in Devon next, for timings check their respective websites. For more information check out the Jerwood Space website, but most importantly of all don't forget to check in with my in depth review of the 2011 Jerwood Drawing Prize here.